The title of my newest book is REDEMPTION so it seemed to me a good topic to write about in a devotion. Dictionary.com defines redemption as an act of atoning for a fault or a mistake; deliverance or rescue; deliverance from sin; salvation; atonement for guilt. The title came about as a result of Jamie, the main character being ashamed of things she’s done in her past as a consultant to the FBI. As a result she feels God can’t love her the way she is. So she seeks redemption by putting herself in dangerous situations to help other people. That makes for a good plot in a suspense novel, but it’s important to know that we can’t save ourselves through good acts, through helping others, or even being really good people. There is only one way to receive redemption: meaning salvation; meaning going to heaven to live with God forever! We are saved through our faith in Jesus—and only through our faith in Jesus. No amount of good works can earn us a ticket to heaven! It doesn’t matter how “good” we are, how much money we give to good causes (including the church), or how kind we are to others. Only our belief in Jesus as the Son of God can save us. And the reverse is true as well as Jamie discovers in my novel, REDEMPTION. Your past doesn’t matter. God loves you just the way you are. He won’t turn his back on you because of your past, present, or even your future mistakes. 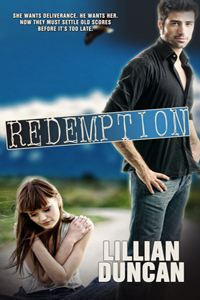 To celebrate the release of REDEMPTION, I’m giving away a $25 Amazon Gift Card. But wait…there’s more! I always feel bad for the people who enter the contest but don’t win. So I’m also going to pick FIVE more lucky names to win a $5 Amazon Gift Card. Just the right amount to buy REDEMPTION! Just kidding, the winners can use it to buy whatever they wish. All you need to do is leave a comment here or under any of the posts with REDEMPTION in the title. Contest ends on October 18! Others may think Jamie Jakowski is a hero, but she knows differently. Haunted by her past, she seeks redemption by helping others in spite of the danger to herself. However, after almost orphaning her daughter, Jamie opts to retire. When a friend needs her, Jamie agrees to one last undercover operation. She is determined to reunite a heartbroken mother with her kidnapped son. Used to working alone, Jamie’s not happy when she’s assigned a partner. And after a failed operation and their failed romance, Enrique Rodriguez is the last person she wants to work with—ever. To succeed, Jamie must confront her past as well as the people who want her dead. UNTIL NEXT TIME…GOD BLESS & GOOD WRITING! Next Do You Recognize Jesus?